Exterior drain tile is one of the most important parts of keeping your basement dry and your foundation from receiving extensive damage. Many homes have interior drain tile but not exterior. This is very common with older homes that typically have clay drain tile. This type of tile may collapse over time, plugging the entire system. 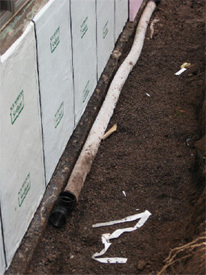 The drain tile we install is 4” in diameter and covered with a geotextile sock. We install the drain tile next to the footing and cover it with ¾" washed rock. 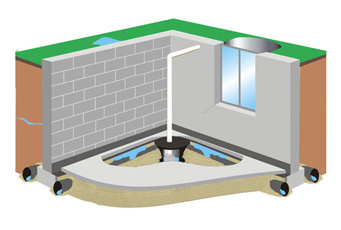 The new drain tile is always connected directly into a Sump Pump pit or day-lighted, when elevation changes exist. In extreme cases drain tile can be installed to an Exterior Sump Pit or to your city’s storm sewer. Washed rock is covered with geo textile fabric to ensure the rock and drain tile stay free of soils that could clog them. Drain tile keeps the water below the floor grade in the basement. Drain tile can be installed vertical into window wells to make sure water cannot build up in them. Interior drain tile is found in most homes. Older homes typically have clay drain tile that can be damaged overtime clogging the entire system. Interior drain tile is critical to keeping moisture and pressure from under your basement floor. Interior drain tile can be replaced by first cutting the concrete floor back about 16” from the wall and removing the concrete and old drain tile. Next new drain tile is installed with ¾” washed rock and protective plastic. Drain tile is always directly connected to a Sump Pit or day lighted. Finally the floor is repaired with concrete.